Spontaneous Acts Of Joyce: THEATER: "R.BUCKMINSTER FULLER:THE HISTORY (and Mystery) OF THE UNIVERSE"
THEATER: "R.BUCKMINSTER FULLER:THE HISTORY (and Mystery) OF THE UNIVERSE"
There's something astonishing happening at the A.R.T. right now. 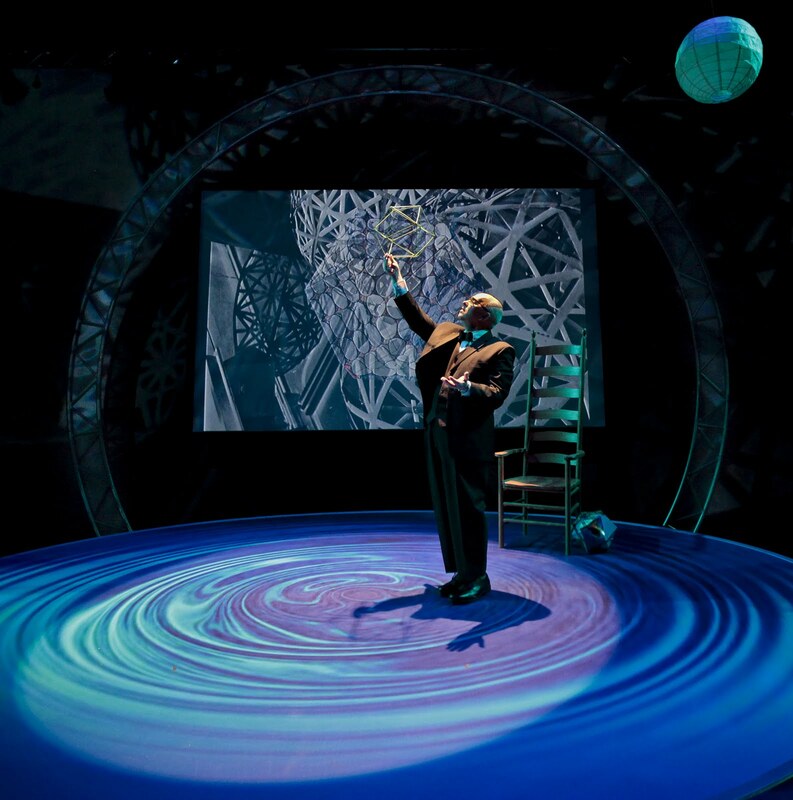 Veteran actor Tom Derrah is starring in a one man show as visionary scientist,inventor,teacher, designer "R.BUCKMINSTER FULLER," inventor of the Geodesic Dome. The production is a wild ride through the extraordinary ideas of Milton MA born Fuller who had a mind Harvard couldn't hold. They expelled him twice. No matter; Fuller's brain yielded an explosion of thought that sprang from the simple kernel of an idea: to do more with less. His inventions ran from fuel efficient cars and showerheads, to houses in a kit; he was obsessed with the connections between science and art, synergy, integrity, god. He whipped himself into a creative frenzy as he talked about man as a living experiment on a dynamic planet which he was the first to dub "spaceship earth"! Well, if Earth was a spaceship to Bucky, then Tommy Derrah blasts off the stage and into the stratosphere of what's possible for an actor; all I wanted to do was hang on for the ride. Derrah captures the visionary's sense of wonder, his expansive intellect, enormous spirit, humanity, and abiding optimism. The sheer volume of the text is as daunting as the content which ranges from the integrity of triangles to their metaphysical implications. Derrah holds the stage and shapes the material over two spell-binding hours. He makes it all look fun and easy, intelligible and accessible. The show is enriched by old film footage of Bucky's family; I had the pleasure of meeting his daughter Allegra who was in the audience the night I saw the play, and the sparkle in her eye let me know I had caught a glimpse of the man himself. I intend to pore over the script-- it may become my new bible. DO NOT MISS "R. BUCKMINSTER FULLER:THE HISTORY (and Mystery) OF THE UNIVERSE." Now through February 5 at the American Repertory Theater in Cambridge.